The Iraqi flag flutters during the opening of the Al-Dora refinery complex in Baghdad last month. 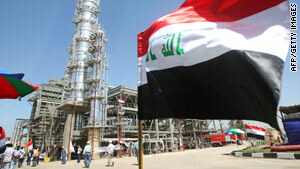 (CNN) -- Iraq's estimated oil reserves have grown by nearly 25 percent, the oil ministry announced Monday. "Iraq's oil reserves which are extractable are 143.1 billion barrels," said Hussein al-Shahristani, Iraq's oil minister, based on data provided by Organization of Petroleum Exporting Countries. The OPEC figures are about 28 billion barrels higher than previous estimates. At $81 a barrel, about what oil was trading at early Monday, the added reserves would be worth about $2.27 trillion. About 70 percent of all reserves are concentrated in Iraq's southern oil fields, with 20 percent in the north and 9 percent in the country's center.